Spin This: "Sleeping With a Friend," "Text Me In the Morning," "I Love You (But I Hate Your Friends)," "First Things First"
It isn’t exactly rocket science for a rock band to gloss up for a modern day crossover. But not all cross the finish line with such gravitas. Depending on the grade of pop, the band could lose their rock cred and may be reduced to David Foster-produced soft rock (think Journey) or fall into the vile pits of critics’ scorn that’s often seen on hate blogs (think Journey). 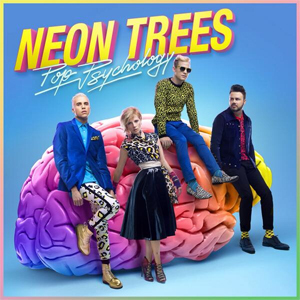 Utah band Neon Trees is a different kind of specimen. After breaking out with the Top 20 hit “Animal,” they kicked out an indie pop formula that merged OK Go with Katy Perry. Their next big single, 2011’s “Everybody Talks” carried over some of the same riffs and rambunctious energy of “Animal.” However on their third disc Pop Psychology, the band warmly embraces the better half of their pop persona without defiling themselves as a bubblegum pop experiment. When the album opens up with tail feather-shaking rock n’ roll on “Love in the 21st Century,” lead singer Tyler Glenn wraps it up with high-tech lingo younger audiences will instantly grab: “I guess it’s love in the 21st century, oh oh it’s tough, broken heart technology/Your kisses tastes so sweet but then you quick delete.” And that is what’s most apparent on this record; a field trip into modern-day topics that appeals to the One Direction generation. It’s obvious when you hear “I Love You (But I Hate Your Friends),” where Glenn talks about his own sexuality (“But you don’t go that way /I thought you had a thing for fancy boys”) and even rewrites the second verse from what’s printed on the inside of the disc just to deal with the politics of band popularity and having a love jones for “blatant sexuality.” Besides the catchy song titles and the percolating subject matter aimed at the 40-and-under, the musical arrangements are built from the ground up as superior workouts that warrant multiple plays. “Sleeping With a Friend,” bathed in dreamy ‘80’s nostalgia and warm synth vibes, is probably their finest hour in the spotlight. Still, it’s hard to shake off the Strokes-like time machine rock heard on “Teenager in Love” and New Wave-ish “Text Me in the Morning.” As the album ticks down to the very last minutes with “First Things First,” the band is still in relatively good form. The aforementioned track sews together a quick bio-doc around the band’s priorities and lessons learned (“There were days and nights I couldn’t see the end/And I swear that music was my only friend”). Even on the album’s safer appetizers, Neon Trees reinforces the need to turn pop into art. On “Voices in the Hall,” the ingredients of otherworldly ’80’s era bleeps and the occasional flickers of Leonard Cohen’s “Hallelujah” help mold a pageantry of sophistication that typically isn’t assembled on the assembly-line records of today. With the smart packaging of catchy melodies, sing-a-long choruses and credible production from Tim Pagnotta, Pop Psychology stays afloat. Quite frankly, it’s their best record to date and shares the stage with Sara & Tegan’s 2013 classic Heartthrob as being one of the most mesmerizing pop albums in recent years.